Join us and many of your Santa friends at the Santa Hustle Smokies 5k on Sunday, December 11, 2016. Get into the holiday spirt with either a half marathon or 5K run Saturday, December 5th, 2015 from Victor Ashe Park in Knoxville, TN. Events benefit the Sunshine Ambassadors – Enriching the lives of people with disabilities through dance! Christmas Rock-n-Roll music will abound from Victor Ashe Park and along the routes! 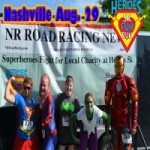 Who wouldn’t want to do a Heroes5K with Dreams and Wishes of Tennessee? It’s All For The Kids! Dreams and Wishes grants wishes to youth who have relapsed from cancer. Join the fight at the Heroes5K! Flat, certified 3.1-mile course, this race is a part of the Nashville Striders Grand Prix Series and serves as the kick-off race to the Making a Move Series. All community members – men, women, boys and girls – are welcome to participate.